Keith was born in Jonesboro while his father was a student at then-Arkansas State College. During Keith's formative years he heard many good stories from his parents about their experiences in Jonesboro and at Arkansas State. 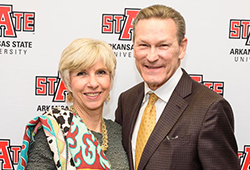 Keith graduated from the College of Business in 1981, and credits much of his success at Arkansas State to the very positive influence and counsel he received from his college adviser, Dr. Dan Hoyt. During Keith's time at Arkansas State University, he was a "working student," holding a variety of jobs from 1970 to 1980 such as Carr's Grocery, factory worker, retail store manager and a pre-loader at United Parcel Service. Upon graduation, Keith joined the management training program of what was then known as Goldsmith's Department Stores in Memphis. A few years later Keith joined a "startup" Blockbuster Video franchise group that would come to own and operate stores in Arkansas, Mississippi, Tennessee and Alabama. Keith ultimately became president and an equity owner of the Blockbuster Video partnerships that comprised the management and ownership of the stores. After 20 years of successful operation as a franchise enterprise, the business was sold in 2009. As a result of the sale of the business, Keith began to look for new professional challenges and ways to "give back" to the community. Keith is now enjoying his "encore" career serving as the executive director for the Wolf River Conservancy, a not-for-profit conservation group in Memphis. Under Keith's leadership the conservancy has raised $46.5 million to build out the Wolf River Greenway trail, which upon completion in 2020 will be a 26-mile linear park and greenway trail connecting Downtown Memphis to the Germantown Greenway. Keith believes that his education and life experiences gained as a student at Arkansas State University prepared him to be successful in an ever-changing world. Keith and his wife Katie both believe in supporting higher education as a way to "give back" and to show their appreciation for the benefits they have received from their education. Keith and Katie have been married for 30 years and live in the Central Gardens neighborhood of Memphis.